A novel nickel complex with mixed ligands [Ni(L)2(EtOH)2(MeOH)2] (HL = 3-hydroxy-2-methylquinoline-4-carboxylic acid) has been synthesized through solvothermal reaction and its crystal structure was determined by single-crystal X-ray diffraction technique. Single-crystal X-ray diffraction analyses reveals that the title compound crystallizes in the triclinic system of the P–1 space group, and exists as isolated mononuclear complex. The intermolecular hydrogen bonds lead to the formation of chains, and the layered supramolecular structure is formed by the strong π×××π stacking interactions. 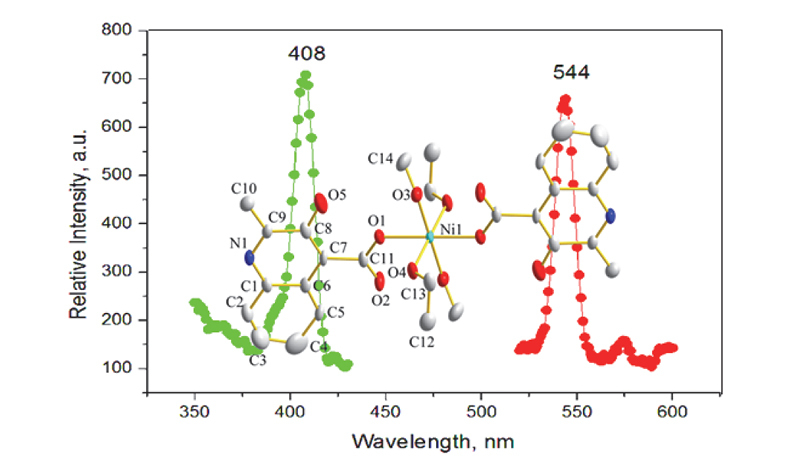 Solid-state photoluminescent characterization reveals that the title compound has an emission in the green region. Time-dependent density functional theory (TDDFT) calculation shows that the nature of the photoluminescence of the title compound originates from the ligand-to-ligand charge transfer (LLCT; from the HOMO of the p-orbital of ligand HMCA to the LUMO of the oxygen atoms). A wide optical band gap of 2.25 eV is found by the solid-state UV/vis diffuse reflectance spectrum.